On a most enjoyable night as the season commenced with the traditional curtain raiser, Poole beat Bournemouth 17-12 to win the trophy for the first time in 4 years. 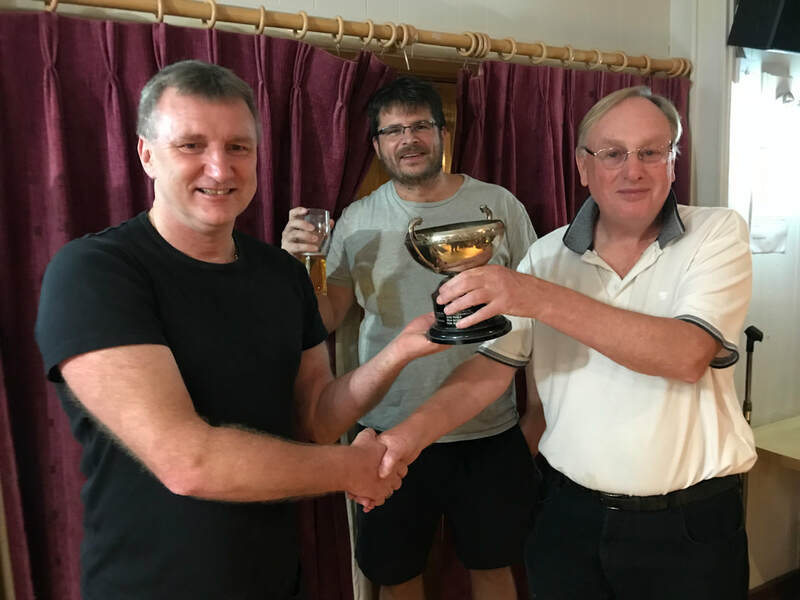 Quote from the losing captain Martin Simons “it was a great night, great venue, great spirit and some great chess and very well done to Poole”. Martin complemented his team on arriving by 7.15pm for the match and he had no withdrawals. His actual words….”proud and impressed”. Winning captain Eric Sachs commented ‘ I am so proud of our team where 18 Poole club members took part and were supported ably by Wimborne and Ringwood players. It was a night when all the players came together, but it is lot of work arranging. Martin did much to bring all his players to the match and was very gracious in stepping down to even up the pairings on the top board. It’s nice to win at the time, and disappointing to lose on the night, but the overall success of the event and the spirit of 58 local players giving their best, playing chess, is the real winner. Special thanks to the helpers Steve Bailey, John Weatherlake, Adam Jaggard and Graham Morris for managing the bookstall etc and anyone else I have forgotten who supported the evening”. In the main photo (top of this item) Martin, on the left passes the 2 Towns Trophy to winners Eric Sach’s Poole. The 2 Towns curtain raiser match every season is always enjoyed and is very sociable. It is taking place again at the home of Poole Chess Club, Royal British Legion, North Road, Poole. 7.15pm for 7.30pm. Games are non-graded. Eric Sachs reports this year there will be a bookstall with over 150 chess books for sale @ just £2 & £3 each. 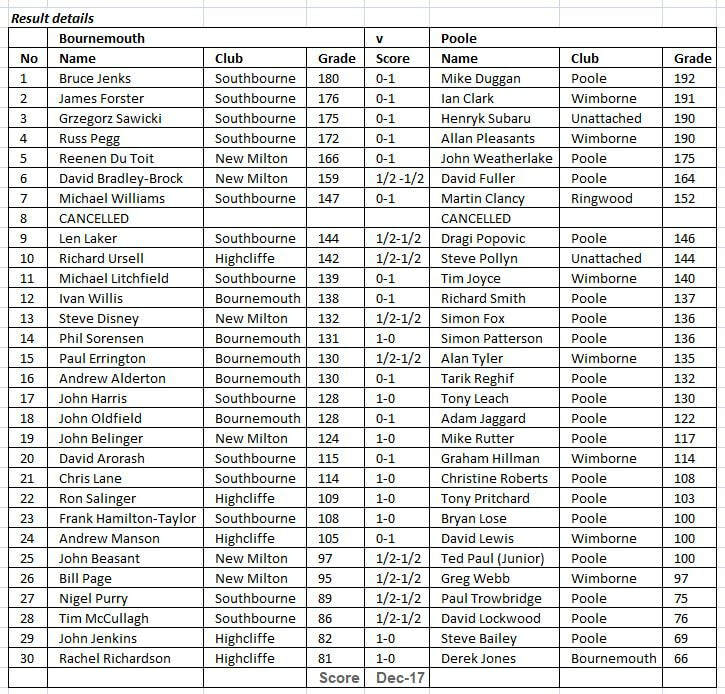 The Poole squad, captained by Eric, may comprise players mainly from Purbeck, Poole, Wimborne & Ringwood. The Bournemouth team is skippered by Martin Simons and their players are expected to come largely from Southbourne, Highcliffe, New Milton & Bournemouth. ​But to make the evening the best possible for everyone, Eric and Martin may need to switch players so your understanding much appreciated. To help with planning, it would be much appreciated if you could let Eric or Martin know your availability in advance. That enables a quicker start and eases complex team allocations on the night. Many thanks!